Very unexpected. He was awaiting a lung transplant for a last few weeks and I guess time ran out. Weird, I was just watching the Simpson's $pringfield episode the other day and his gag on the ep is fantastic. At the aiport. Bart holds up a sign reading "Robert Goulet"
Robert Goulet: Are you from a casino? 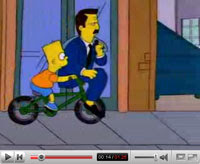 Bart: I'm from a casino. Robert Goulet: Good enough for me. Let's go. Nelson: Your manager says for you to shut up! Robert Goulet: Vera said that? I hate when celebs pass away that aren't "supposed" to pass away. He'll be missed. PS We're both blogging up a storm tonight Brett! When it rains it pours I guess. A lot of times it's challenging to get that "perfect balance" between user friendliness and visual appearance. I must say you have done a great job with this. Additionally, the blog loads extremely fast for me on Chrome. Outstanding Blog! I know I am getting know-how daily by reading thes pleasant content. It's really a cool and useful piece of information. I am glad that you just shared this helpful info with us. Please keep us informed like this. Thank you for sharing.